ChrissyAi: The Monday Blues Blog Hop #5! The Monday Blues Blog Hop #5! 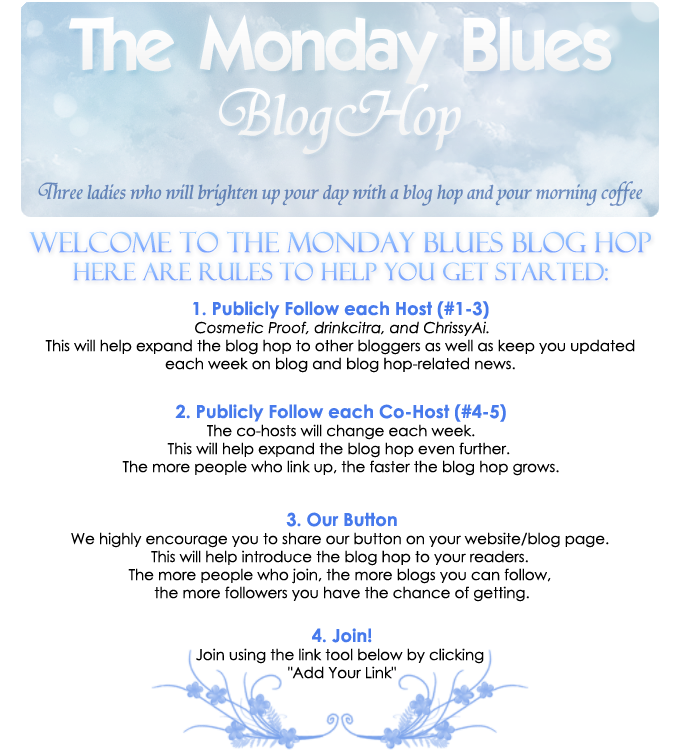 Welcome to the fifth Monday Blues Blog Hop hosted by Traci of drinkcitra, Jayne of CosmeticProof, and myself! This weeks co-hosts are Rachel of Blush and Brunch and Denysia Yu! Thanks so much for joining! Aww, that's so sweet, thank you!! New to the blog hop :) Thanks for hosting it! and also thank you for your nice comment at my blog I really appreciate it! :) I'm looking forward to read your blog posts! Awesome, thank you for joining! Of course, you have a lovely blog!